Football Manager 2015 is entering it’s swansong, it’s home stretch or it’s final countdown if you like, and many people are looking forward to the next edition of the game that we all love and give up our lives to. So as we are edging closer to the release of Football Manager 2016 I thought that I would hand you my top 10 favorite players of Football Manager 2015. By handing you the top 10 Football Manager 2015 players to buy I like to start the debate of what the best XI of Football Manager 2015 would be in your eyes. The top 10 FM 2015 players will be my first ever time writing about Football Manager. I would like to think that I have a good knowledge of the game but I am not necessarily gifted at it, but I know one thing. I am one of the very many addicted fans of the game and I have had some fantastic experiences with Football Manager, this year in particular. For me there is no better place to start than with my top 10 players to use in Football Manager 2015. A list that does not include Lionel Messi or Cristiano Ronaldo might I add. We all have those players that we run to tell our friends about. That player that you know is going to give you that big performance in the biggest games and I have been fortunate to have had many very good players at my disposal throughout this year. I have not really delved into the lower leagues because it is not something that particularly interests me, so expect to see some fairly well known players. But if you can guess my #1 player right now then please take a gold star. ‘The Ox’ was an absolute revelation in my Arsenal save that I did recently and for two seasons in a row he destroyed the Premier League defences and even broke the 20 goal barrier. In an attack that included the likes of Ozil and Sanchez it was the young England international that stood out and got me excited. I remember one game where he managed to get himself 3 assists, at a point where he wasn’t anywhere near the starting XI. From that moment on he has been a real superstar and managed to bag the Young Player of the Year award in my second season. His stats aren’t exactly amazing and really don’t compare to the likes of Raheem Sterling or even Memphis Depay but Alex Oxlade Chamberlain had consistently produced the goods for me and is constantly improving. A truly great player and one that I would highly recommend. Another wonderkid of Football Manager 2015 here and another one that far exceeded my expectations of him when I signed him up for my Liverpool save at the start of the FM 2015 season. Originally cover for Morgan Schneiderlin in my side the Croatian proceeded to become one of my key players as I pushed to regain the Premier League. 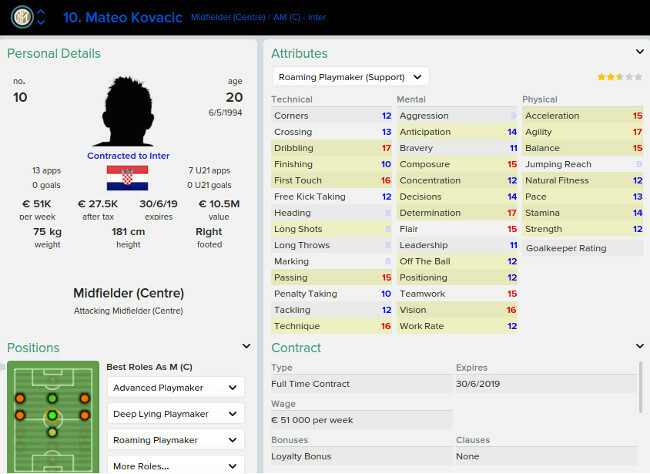 Used in the Roaming Playmaker role Kovacic was allowed to really influence affairs all over the pitch and I found that he was very easily dominating the best midfields even when I first signed him. Not necessarily contributing much in terms of goals or assists he still maintained an average rating of mid 7’s for me. But his overall stats are very impressive indeed, he maintained a passing accuracy of 88% and completed over 4 tackles a game. If there was a role of complete midfielder then Kovacic would fit in there with ease. There is no stat that is underwhelming when I look at him and for the price I signed him at of £30 million I would say he was a bargain. But if you want to sign him normally Inter wouldn’t even listen to your offer and demand a deal well over the £70 million mark. So if you want to experience his class you must either be patient or just play as Inter. Jeronimo Rulli is a player that is a fairly unknown quantity to fans in England but when I first found him at the beginning of the very same Liverpool save as Kovacic I knew I had to sign him up. It took me two years to finally save up the money, and sell Mignolet, to bring in the Argentine super keeper. 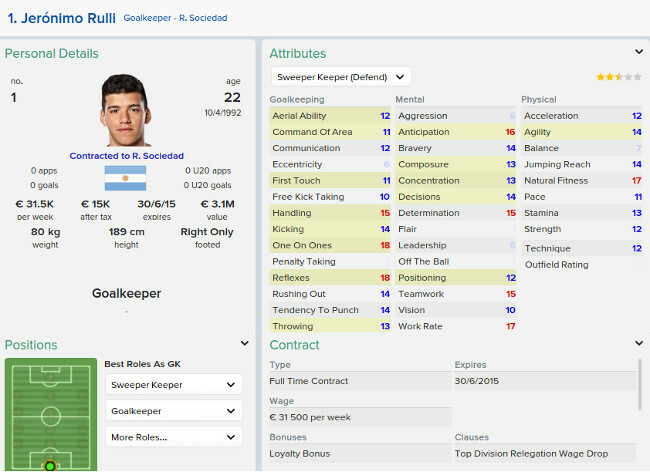 Goalkeepers are very rarely regular saviours for me this year and they tend to make some stupid errors that tend to leave me and my computer screen close to a fist fight, but Rulli makes up for these errors with some great performances. I remember I once beat Chelsea 6-0 at home but Rulli still managed to get the man of the match. He was the man who made everybody else seem better. Rulli was basically my 2014/15 David De Gea in that save and although his ratings aren’t anything special he is by far my favourite goalkeeper in the game. Using him as a sweeper keeper is almost fool proof because he is so solid on the ball as well and is quick of his line. Sign him up! This is a player that I knew absolutely nothing about prior to the release of this game but it did not take me long to take an actual interest in what he is doing in real life. When a player inspires you to find out what he is like in real life then you know you have a player on your hands. I signed him up for 4.8 in my Napoli career mode and used him as a substitute for the most part. It was devastating as soon as he came on, the lack of pace in Serie A was really evident and even used as a supporting left winger in a 3-4-1-2 he managed to produce moments of pure wonder. Smashing in 30 yard screamers or making blazing runs across the pitch and scoring a wonder goal. He is so quick in the way that he develops too and within a couple of months I saw the Wanted sign next to his name. I thought that perhaps it would have been somebody interested in loaning him, no it was Barcelona interested in making a £40 million offer for his services. Just to tell you how good I think he is, I rejected the bid. He has pace, power, skill and good shooting already. Would you sell a 20 year who has that ability. In my eyes the best Box to Box midfielder in the game we have England midfielder Jordan Henderson, a player who literally epitomizes the word consistency with his performances. He was averaging a 7.7 over a season as my captain from day one and in a time that saw a lot of players coming and going from my starting line up Henderson was still standing in my midfield. Only Raheem Sterling could say that he was held in that same company and many would say he is the best young player in the game. Jordan Henderson has quality in every area and is very versatile, he got me out of a few sticky situations if I had an injured right back. He was scoring long range goals, making late runs into the box and laying on goals for team mates as well. He could have very easily been my number 1 player but there is a lot of quality in this list. If you can sign Henderson then do it, forget if you are Barcelona or Bayern Munich he is good enough to oust the best players in the world. I’m sure you have fallen victim to the deadliness of big Vincent Aboubakar in your own saves when he signs for either Chelsea or Manchester United inevitably. Each time I forgot that perhaps I should bid for his services and allowed him to be snapped up and score the inevitable hat trick against me. But in my Arsenal save I finally managed to get him into my team. The wait was certainly worth it. In his debut season for me the Cameroonian sought out to break every goalscoring record he possibly could. He hit 56 goals in 56 games and broke the Premier League record for most goals in a season whilst he was at it. What was so amazing about Vincent Aboubakar was his ability to pull something out of nothing. He would be quiet for a full game and not do anything then suddenly he would spring into life and score 2 goals in ten minutes and be man of the match. He is well and truly lethal and from my experience he is certainly the best striker I have used. He will score you every type of goal possible and will do it consistently too. For £30.5 he turned out to be an inspired piece of business. This man is a freak of nature, he is not only quick but also absolutely huge and for a centre back there are no better qualities that can be found. A threat from set pieces at both ends Niklas Süle is one of the best young centre backs in the game and actually stands out as my favourite. Not the most well round player in terms of technical ability he is a real brute at the back and many teams struggle to beat him at the back. He was paired up with Samuel Umtiti and Rulli as my goalkeeper and centre back combination and with the speed we had no side could play the long ball over the top. That very same ball that always seems to break me every single time was negated the moment I signed him up. He instantly improved the side as a 20 year old CB and how many young players can walk into the side that just won the Champions League? Again he will cost you an absolute fortune but he will produce the goods for you if you give him the game time. When I started my Madrid save as a little bit of fun to try out all of the biggest players in the game I looked at my options. 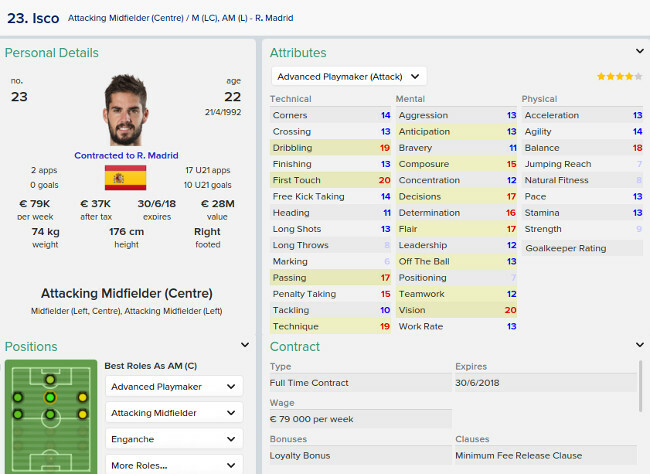 I was surprised to see that Isco was better equipped for my Advanced Playmaker role. High dribbling stats and a vision stat of 20 was something that really caught my eye. I started him in the Spanish Super Cup ahead of James Rodriguez who was injured and he took control of the position from then on. He got a goal and 2 assists against a very compact Atletico defence which is no mean feat. He eclipsed the likes of Messi and Ronaldo over half a season with his average rating and was consistently my best player. Yet of course he did not make the top 3 of the Ballon D’or or even manage to win a place in the team of the year. In fact he couldn’t even win the pity prize of European Golden Boy, sorry Sterling, which instead went to Johannes Geis who had ratings no where near the quality of my Spaniard. I was fuming and rightly so because Isco had been a revelation and was one of the best creative players I have ever used. In fact if it wasn’t for the next player I would say he was the best. Unfortunately a certain German is in the way of his crown. But bronze is still commendable in a list and game filled with quality. I actually had plans to offload Özil when I first took over Arsenal thinking that I could do better than him. 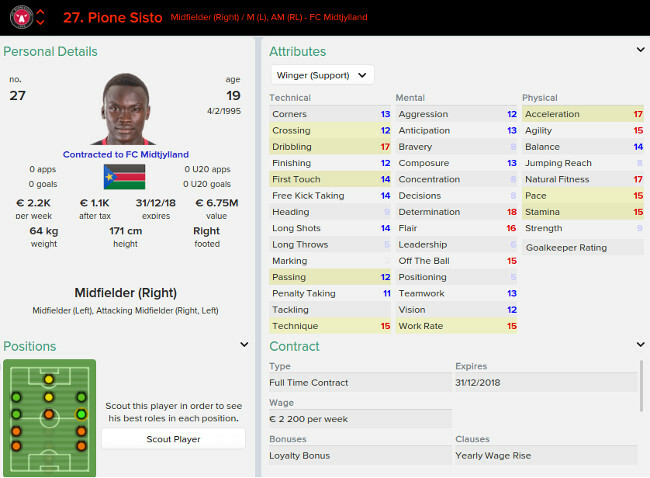 I can tell you now there is literally no better playmaker in Football Manager at the start of the game. Ozil is pure magic. With a vision of 20 just like Isco he is constantly creating chances for the team and rarely had a bad game. In my first season which featured Danny Welbeck (who is not #1 on this list…) and Olivier Giroud up front I think Mesut Özil deserves a round of applause for hitting over 30 assists for the campaign. The sort of statistic that he was doing all of the time when he was at Real Madrid surrounded by players like Ronaldo. Really the fact I had no absolute world beater around him is the reason Özil beats Isco. If the two had swapped places and Mesut Özil was at Madrid with Ronaldo he could have entered into the 40 assist mark because he was just a machine. Chance after chance created for a team mate and if the dynamic duo of Welbeck and Giroud were not up front he would have hit that figure at Arsenal too. My point is he is amazing and you should try him out as soon as you can because you will be just a mesmerized as I was. Silver for Özil so just who gets the space at the top of the podium? Well it is time to answer that burning question and reveal my favourite player of Football Manager 2015. Wow! This is the description that I would use to describe the marvel that is Munir. When the game was first released I identified him as a player to watch myself when I saw him in action for Barcelona a few times. He had a release clause that was quite low and I took a punt on him in my original Liverpool save. Only for him to sign a new contract at Barca and reject me. I had to wait a very long 6 months before I could get my man. I had unsettled him because he hadn’t played much football at Barcelona and I was offering him a place in a team filled with young talent like Memphis and Sterling that were flourishing under my leadership. What followed next will always be my best transfer business that I will ever conduct as an FM manager. Barcelona offered me a swap deal for Mamadou Sakho straight for Munir el Haddadi who they were refusing to sell for anything less than £40 million. Sakho was decent but my vision for Munir was far greater than anything Sakho could have produced. So in came the young Spanish wonderkid. I put him on the bench for his first game against Stoke City and was just waiting for the perfect opportunity to bring the Spaniard on. Remember a certain number 7 who made his debut against Stoke? Well Munir was about to completely smash his debut to pieces. Within seconds of coming on Munir looked right at home and picked up the ball 40 yards from goal, in his role as shadow striker, strode towards goal and unleashed a bullet that nestled into the net of Asmir Begovic and increased our lead to 5-0. Safe to say I was marvelling at my own genius at this point. What happened next was typical FM. He got injured for 3 months. Typical bad luck. Yet when he returned to play in the side his amazing impact continued and he brought us back up to the top four with a series of great performances. It was the 15/16 season that sealed the deal for me. Playing just behind Daniel Sturridge in my 4-2-3-1 formation Munir was about to have the season of his life. He hit 40 goals from this position and played a big part in the greatest title race I have ever seen. Imagine this. Final day of the season and you are 1 point behind champions Chelsea. You are away at Swansea who finished in a lowly 16th and Chelsea were at home to already relegated Sunderland. The chances of us winning the league were very low indeed but it had to be worth a go. Swansea score first with Michu and suddenly I fear the worst. Sunderland take a shock lead at Stamford Bridge which seemed trivial at that point. Munir finds two goals before half time to put us in front and the dream is on for now. Second half starts and Swansea find themselves level after ten minute after an own goal from Jon Flanagan. Meanwhile at Stamford Bridge there is a 2nd goal for Sunderland. 85th minute and all hope is lost as Swansea seem to repel every attack we throw at them. Step up Munir. Free-kick from the edge of the area that nestles straight into the top corner. It was unbelievable and we had won the league. For a grand total of 9 minutes until Neil Taylor decided to become Roberto Carlos and strike a goal of the season effort past Mandanda in the 94th minute to do a reverse Aguero moment and win Chelsea the league. 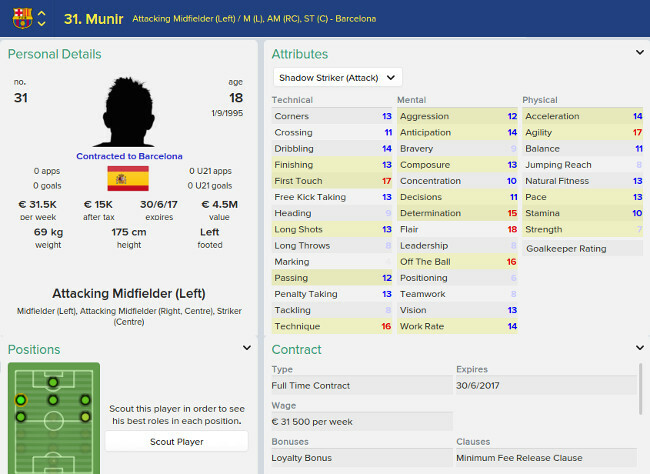 My point is, Munir is the man that made all of that possible and I do think that because he was my original go to man of FM15 he deserves to stay that way because no player has produced so many big moments for me as of yet. Do you agree with my top 10 list? 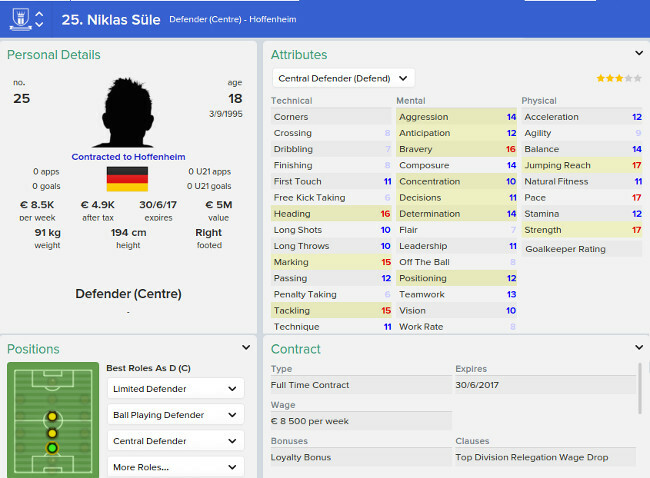 What are your top 10 favourite players to use in Football Manager 2015?